ATCs are 2.5 x 3.5 inches. same size as a baseball card. this was for a Blue & Silver swap. the dark shapes are shiny silver (from an aluminum baking pan). it was too hard to get both the shiny area and the watercolor to look right in one scan so i opted to make the watercolor look reasonably close. I just love your card 1da ! The blues and the silvers are gorgeous together, plus it's very clever how you have reflected the (tri)angularity of the angelfish in the triangles in the background. I've heard of ATC's from lpg - she has done some lovely craft ones, pictures <a href="http://www.brainformation.com/forum/viewtopic.php?p=56299&highlight=#56299">here</a>. 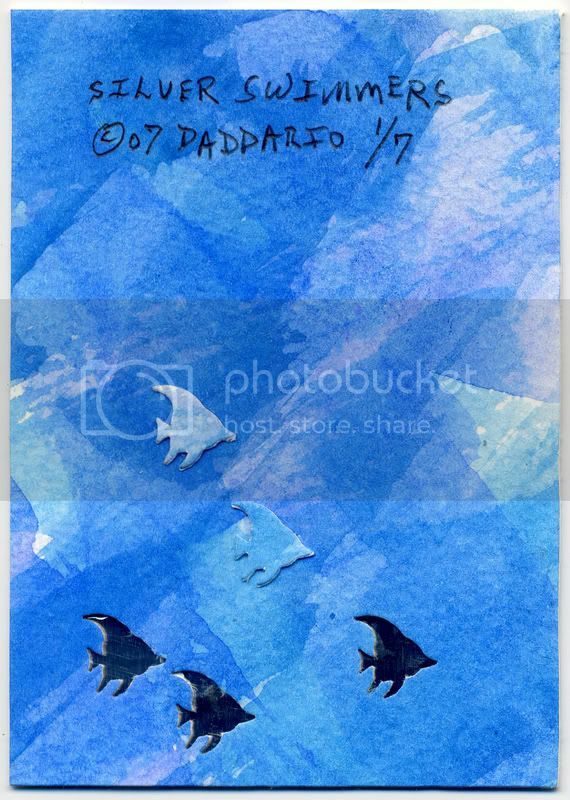 aloha Makinamess - i liked the way the angelfish shapes integrated with the watercolor pattens too. this is 1 of 7 i did a long these lines for this specific swap - everyone involved with this swap had the same theme of Silver & Blue. how we create within that theme is up to each person. yes lpg stunned me with her ATCs. in fact... we have a trade going that i am very delinquent on. i'm in the process of catching up on trades as well as keeping up with current projects and swaps.